Guests Bobby Kuske – 2017 Bethesda College graduate, and Dr. Wanda Routier – Assistant Professor, Director of Graduate Special Education Programs, and Faculty Liaison for Bethesda College – Concordia University Wisconsin, talk about the wonderful opportunities for students at Bethesda College of Applied Learning at Concordia University Wisconsin. Bobby shares what he learned at Bethesda and how his experience will benefit him in the future, and Dr. Routier shares some exciting things about Bethesda College. Learn more about the Bethesda College of Applied Learning at bethesdalutherancommunities.org/bethesdacollege. 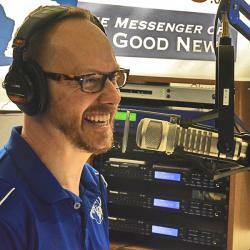 Guests Celina Haupt, Women’s Coordinator at Concordia Seminary St. Louis, and seminary wives Kelsey, Krista, and Kyla talk about the transition that happens in the Springtime for seminary families and preparing for the changes that will occur. Second-year wives are preparing for vicarage placement, and fourth-year wives are preparing for their husbands’ first call. Watch Call Day at CSL at callday.csl.edu.